“Sometimes, you just have to unleash yourself and all your power if you want to feel the sheer thrill of pure freedom,” says Bonnie Marris of "Into the Great Wide Open." It is hard to tell if she is referring to the horses in her painting or giving a little advice on life. Either way, she’s right. It is this passion that is the magic behind her art. Horses run for the joy of it and the love of their own speed with each horse racing to win. When Marris paints, it’s for the joy of expressing the condition of being free. 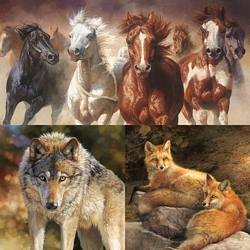 Whether that is of rushing horses, a pack of wolves at play or a fox hunting a woodland stream, it is that love of freedom that comes through in her art. Aligned in perfection with her unbroken spirit is her mastery of the elements of color, composition and light. The results are the pure wildlife pleasure you find in the Fine Art Limited Editions of "Into the Great Wide Open" – grace, beauty and the expression of joy.